Destiny 2's Hunter class, commonly represented by Nathan Fillion's Cayde-6, specialises in dealing out elemental damage across the battlefield through a variety of weapons and abilities. In this Destiny 2 Hunter guide, we'll be taking a closer look at the Destiny 2 Hunter class, including the different abilities and Super Abilities that the Arcstrider, Nightstalker and Gunslinger subclasses have to offer the player. If you needed help with anything else throughout this expansive game, then be sure to head over to our Destiny 2 guide hub, containing information on all the new abilities for the Titan and Warlock classes, as well as detailed walkthroughs. The previous Bladedancer Warlock subclass appears to have been entirely replaced from the original Destiny with the Arcstrider subclass in Destiny 2. Elsewhere, the Hunter can summon a flaming pistol, which was first shown off by Cayde-6 back in the Destiny 2 gameplay reveal. To unlock the second and third Hunter subclasses in Destiny 2, you'll need to keepan eye out for any side missions you can undertake near the Shard of the Traveler in the European Dead Zone. When available, these missions will let you take down a horde of Fallen using the Super Ability of the brand new subclasses you're trying to unlock. It doesn't take more than a few minutes to complete, and it's effectively a basic tutorial area for your new Super Ability. Marksman's Dodge - A directional dodge that can be used to either quickly move yourself around the battlefield, or to dodge out of the way of oncoming damage. Gambler's Dodge - This effectively works the same as the Marksman's Dodge ability, except this version generates significant melee energy when used near enemies. High Jump - Jump a second time while airborne to reach greater heights. Strafe Jump - Jump a second time while airborne with strong directional control. Triple Jump - Jump a second or third time while airborne. 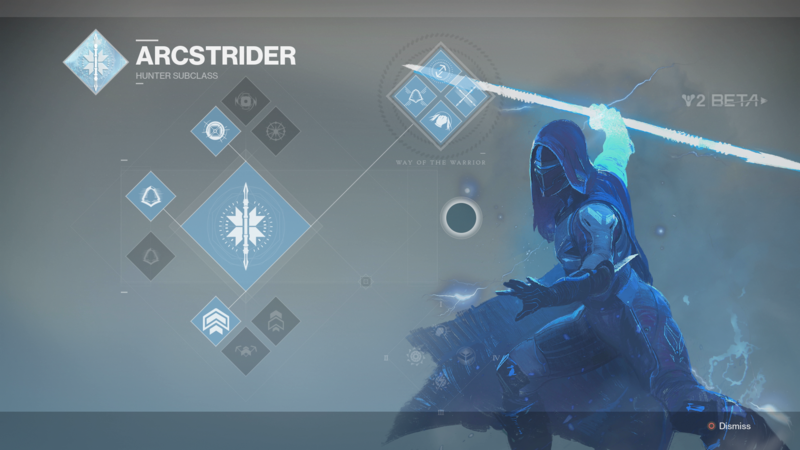 The Hunter's Arcstrider subclass gives the player control over a large Arc Staff, while also giving them the power to move around the battlefield rapidly, evading enemy fire. L1+R1/LB+RB - Forms a staff of pure Arc energy for the Hunter. R1/RB - Dodge around the battlefield, striking your nearest enemies with the Arc Staff. Arcbolt - Chains bolts of lightning to nearby enemies. Flux - An explosion which deals additional damage when attached to enemies. Skip - Splits upon impact, creating multiple projectiles which seek out enemies. Destiny 2's Arcstrider Hunter in action. Deadly Reach - Dodging increases your Melee range, allowing you to strike enemies further away. Combat Flow - Melee kills recharge your Dodge ability. Combination Blow - Kill an enemy with this Melee ability to regenerate your health. Lethal Current - After Dodging, each Arc Staff hit creates aftershock lightning damage. Disorienting Blow - Strike an enemy with this Melee ability to disorient the target and nearby enemies. Focused Breathing - Sprinting recharges your Dodge ability. Combat Meditation - When critically wounded, Melee and Grenades recharge faster. Lightning Reflexes - You are harder to kill while Dodging. The Gunslinger subclass in Destiny 2 largely brings back an old Hunter subclass from the original Destiny, once again providing the player with a flaming pistol for a limited amount of time, which deals out some hefty damage. 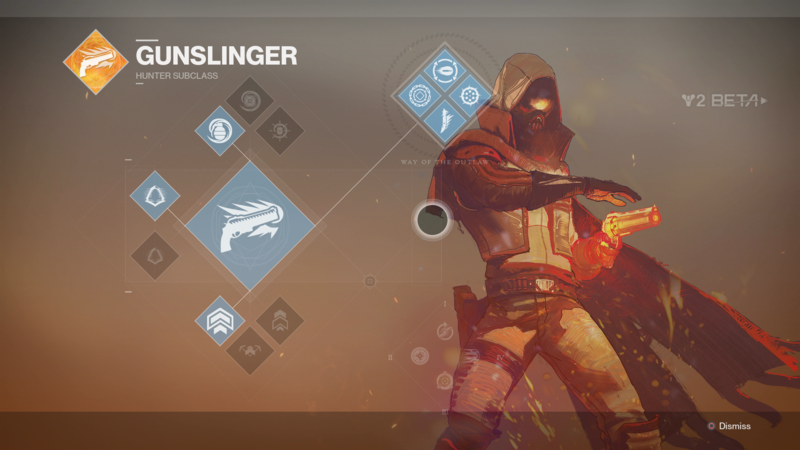 The changes from the original game to the sequel are subtle in the Gunslinger subclass, but refine the abilities that the Hunter can use. L1+R1/LB+RB - Summons a flaming pistol that deals Solar Light damage to disintegrate enemies. Incendiary - The explosion from this grenade sets enemies on fire. Swarm - Detonates on impact, releasing drones that seek out enemies. Tripmine - Sticks to surfaces and triggers when enemies pass through its laser trigger. Deadshot - Significantly improves your ability to hit with the Golden Gun. Chains of Woe - Precision kills increase reload speed for you and nearby allies. Explosive Knife - Throw a knife that explodes shortly after impact. Six-Shooter - Golden Gun can be fired quickly up to 6 times, but has a shorter duration. Knife-Juggler - Precision kills with this throwing knife immediately recharge the ability. Practice Makes Perfect - Each precision hit reduces the cooldown of your Super Ability. Crowd-Pleaser - Enables precision damage with the Golden Gun, and precision hits generate Orbs of Light. Line 'Em Up - Precision hits with the Golden Gun increase its damage and duration. The Hunter Nightstalker class, first introduced back in the Taken King DLC for the original Destiny, will make a triumphant return in Destiny 2, bringing unique abilities like the Shadowshot and the Swarm Grenades. L1+R1/LB+RB - Tethers enemies in a certain radius to an anchor, which slows and silences them for your fireteam to eliminate. Swarm Grenade - This grenade detonates on impact, releasing drone grenades that seek out nearby enemies. Incendiary Grenade - Any enemies in the radius of this explosion immediately catch on fire. Tripmine Grenade - Sticks to a surface and explodes when an enemy passes through its laser beam. Snare Bomb - This smoke bomb sticks to a surface and detonates when enemies are near, blinding and disorientating them. Keen Scout - Sprint and sneak faster, gain an enhanced tracker, and tethered enemies are marked so you can track them easily. Deadfall - The Void Anchors fired from Shadowshot become traps, and they also have increased range and last for longer. Vanishing Step - Dodging makes you vanish from sight for a short time. Vanish in Smoke - This smoke bomb creates a cloud that makes you and your allies invisible. Lockdown - Grenade and smoke effects last for twice as long. Heart of the Pack - Killing tethered enemies creates orbs of light, and increased mobility recovery, and resistence for you and your allies. Moebius Quiver - Shadowshot can be fired multiple times in succession, dealing massive damage to enemies caught in the blast. The Hunter is once again functioning as the most nimble Destiny 2 class, able to move around the battlefield with ease unlike the Titan, but not necessarily being able to withstand as much damage as the Titan class. Both the Arcstrider and the Gunslinger Super Abilities focus on dealing out elemental damage, as the Hunter once again has some significant damage at their disposal.